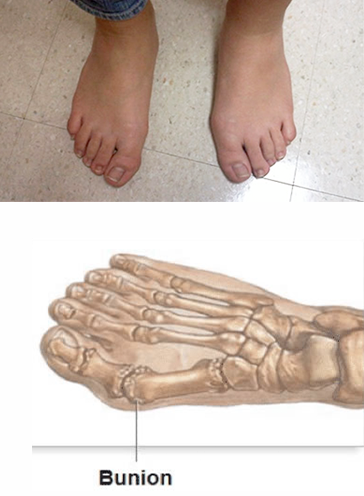 Juvenile Hallux Abducto Valgus (HAV) is the scientific name for a bunion of the big toe. The word Hallux refers to the big toe and Abducto Valgus refers to the angulation that develops within the big toe joint. A bunion consists of a hard bony bulge at the joint of the big toe, and often the big toe will lean in towards the smaller toes. Though bunions are more common in adults than children, Juvenile HAV can present in children as young as six years old, and can affect anyone. The signs and symptoms of Juvenile HAV begin with the physical signs; the area around the big toe joint may become swollen, large and prominent. The big toe may also lean in towards the smaller toes. Other symptoms generally include pain in the area, limitation or more difficulty walking and problems can arise with wearing normal footwear. If left untreated Juvenile HAV can cause problems for your child later in life when they become adults. Biomechanical position of the foot – is the foot position responsible for the bunion? Genetics – is there a genetic predisposition for a bunion to form? Footwear – is the footwear shape or instability causing the bunion? Activity level – is the activity level too great for this particular foot type? A bunion or Juvenile HAV forms due to a combination of the above factors, with the most common being the biomechanical abnormality, this can lead the abnormal pronation in the foot. The main objective is to control excessive abnormal pronation to reduce the medial forces acting upon the bunion. Reducing this force and stress will assist in proper weight redistribution away from the bunion. Symptoms will often improve within a few days. Orthotics help control this motion by supporting the medial longitudinal arch and reducing excessive pronation redistributing weight away from the bunion at toe off.